Rob grew up in Massachusetts where his version of yards equaled grass, while Nam grew up in Southern California in a first generation Vietnamese family, where their version of yards equaled chickens, herb gardens, fruit trees, and lots of weeding (which Nam still has fond memories of). Now married with two young children, Rob and Nam have made Benicia their home. 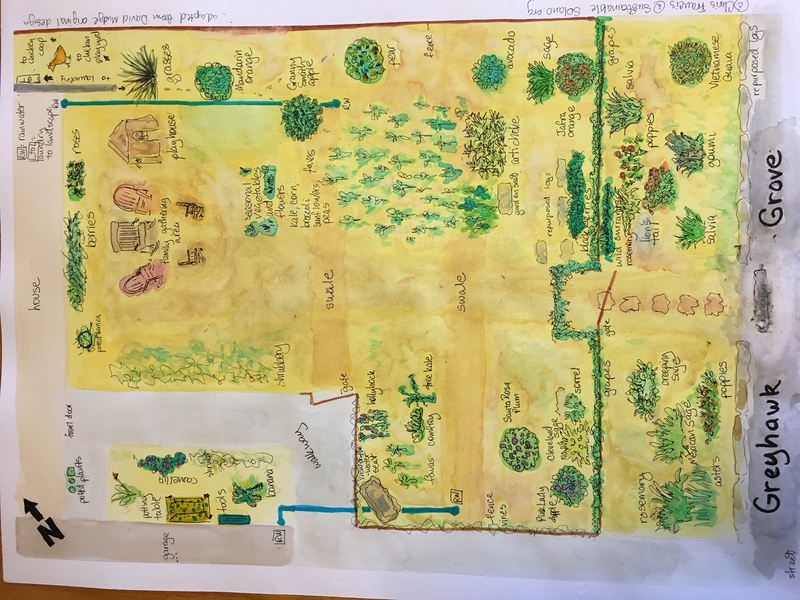 Rob’s view of a yard has evolved to include gardens and fruit trees and the whole family cherishes time in the garden. As a young family with no other family members nearby, they would like to be more involved in the community. Their oldest son Perry has autism, and Rob and Nam have found that working on their garden helps to relieve stress from the demands of raising a child with special needs. They also find that Perry is more relaxed outside, in more natural settings, and he loves composting and turning the soil. Nam is currently home to care for their children, and is interested in food systems and urban gardens from a personal and public health standpoint, having recently earned her Masters in Public Health. Rob, a high school teacher, wants to teach the boys about good stewardship and give them the excitement he feels in growing something. Rob and Nam chose to apply because they know given the start and the guidance, their food forest will grow into fruition with them and their family. It would be making their dreams a reality. They have been supported by so many in their community have no hesitation about a demonstration/teaching yard, especially since it would be easily accessible in the front yard. 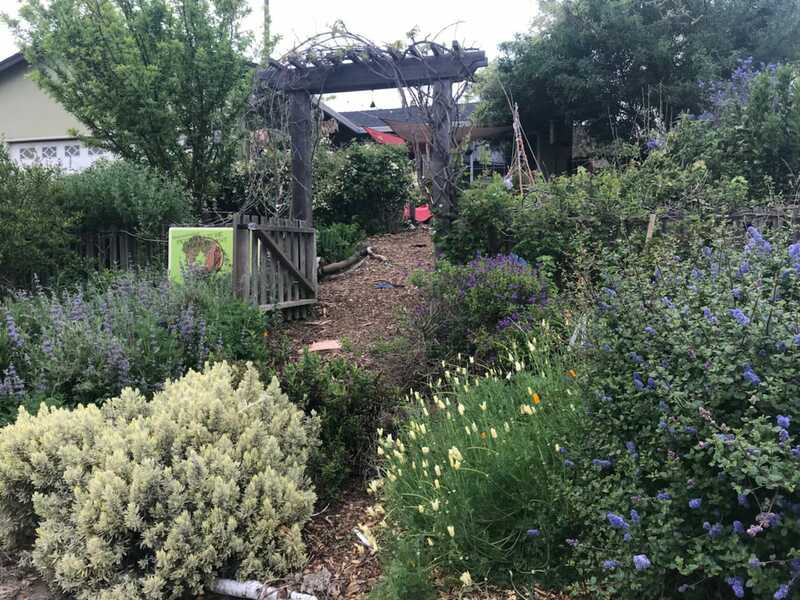 They envision children from Robert Semple walking over to learn about it, linking it to other organizations (such as Cooking for Kids, Loma Vista Farm) and using it as a springboard for urban farming. As part of the Benicia Community Gardens grant, volunteers dug up our yard, installed swales (fancy word for big ditches filled in with mulch to retain water), and connected our laundry system to the landscape so that every time we wash a load, the washer pumps the water out to the yard. I can’t recall exactly, but that’s about 40 gallons of water. The greywater folks ran piping and dug greywater basins to most of the fruit trees, and in these basins there is a spigot which rests in a PVC pipe that it empties into. On top of this contraption should be a covering of some sort so that stuff doesn’t fall in and clog up the pipe. After tossing around a few ideas (and yes, we could have just gotten a 4″ pipe cover), Rob and I settled on a tea theme. When we thought of what to do to cap the pipes, we thought we’d paint ceramic pots and cups. Wouldn’t that be cute! Then we remembered that we have two very young boys–who play hard. We’d be painting pots every week to replace the ones they’d break. And do we want shards everywhere? So then I thought, iron teapots–virtually unbreakable in little (or even big) hands, heavy enough that they won’t run too far with them, and quasi-weather resistant. And even if they do rust, we wouldn’t mind too much. Iron teapots are a bit pricey. It’s a little bit overkill for pipe covers, but as we noted in our application essay–gardening is what takes our mind off of worrying when everything else is a little crazy. Over these past few weeks, as we look at Perry’s IEP, as we hired a lawyer, as we look at job options and crazy schedules, we look to the yard. Rob looks forward to the time after both boys are in bed and he gets to go outside and furtively water the avocado and Chilean guava tree. It’s his relaxing time. I like to peek around while the boys are wandering around in horse poop and scooping out dirt and report back that “Perry’s Easter corn is growing”, or that “There’s a berry on Newbury (We have two blueberry bushes–our first is named Blueberry, so our second is named Newbury)”, or “We have the teeniest, tiniest pink lady apples growing”. It brings us a small measure of happiness. The point being that there is a little elephant-shaped teapot on its way to us. I hope it brings us, and the garden, good luck. See a gallery of Greyhawk photos here.